Now that the Oscars are finished, and celebs are jetting off from LA to their homes across the globe, I thought this a good a time as ever to put a little focus on plane beauty. Yes, plane beauty. Or perhaps it should be called deplaning beauty. 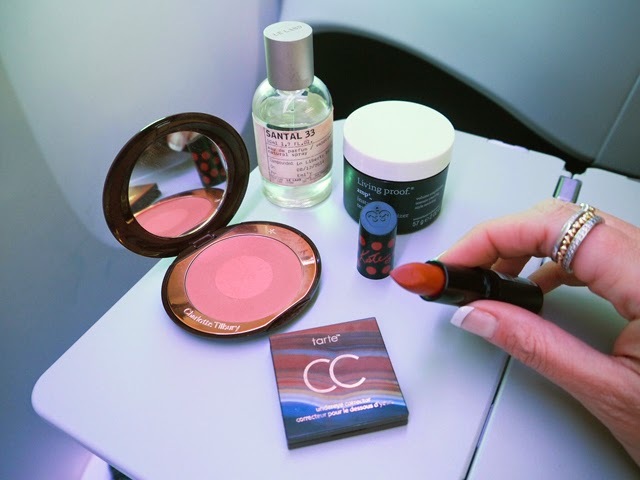 Last month, while on my own journey to LA, I put together a mini beauty to kit to turn flying torture into beauty perfection upon arriving at the destination. We all know we're limited by what we can bring onto a plane for beauty- basically your whole kit has to fit into a rather inconvenient sandwich bag, and has to be 3.4 oz or below in size - but I do believe if you are smart about what you pack, this becomes more a luxury of less-is-more than "I'm missing my whole kit and caboodle." So - what should you pack in your carry on to look like a Hollywood movie star while deplaning? 1. Your most trusted moisturizer. I haven't included a particular one here as I do believe you don't want to take chances using a new moisturizer for the first time while on a plane. Your skin is dry - extremely dry - and it's going to soak up this moisturizer like a sponge. So go with an old trusted skin buddy! Alongside this, the best thing you can do for your skin while on board is drink. Buy two 2-litre bottles of water in the airport and sip them throughout the flight (this is suggested for 10 hour+ flights). Your skin will thank you - trust me. You won't look so much like a zombie while disembarking and might even have some natural glow left you in. Planes are just skin killers. Plain and simple. 2. Your makeup kit. I only ever have three essentials for my skin when it comes to makeup. I pack a great under eye concealer, a kick-a$$ red lippie and a trusted blusher. I feel like less is more when you are putting on makeup. The concealer will cover the no sleep, the blush will give your skin life and the red lip will make you look like you are ready for absolutely anything. Basically the red lip saves your bacon. 3. Now, onto hair. At Christmas I discovered an absolute blessing for travel hair. It's called Amp and it's from Living Proof. No surprise there as you know I love the brand. Amp works exactly like it advertises. The product is like more or less a texturizer that provides some much needed volume to get rid of plane-hair. You know what I'm talking about. I'm talking about that hair that's flat as a pancake in the back and more or less looks like a rat nest after five hours of attempted sleep. Run a brush through your mane and add some amp to give a look like you've just stepped from a salon. 4. Do NOT forget scent, people. However, in order not to fume-out your plane neighbor, do the whole place some good and apply in the bathroom. There is nothing worse than someone spraying perfume in the main cabin. On my way to NYC I had a gent next to me feel as if spraying AXE from head to toe was an appropriate action before landing. Ugh. But we all know how it feels getting off a long haul flight - icky! You haven't showered in a long time (unless you are lucky enough to be on one of those fancy schmancy new planes with a shower) and you want to feel refreshed.